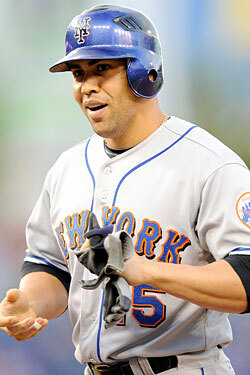 Carlos Beltran had knee surgery yesterday and will miss the next twelve weeks. Sadly, news like that is hardly shocking for the Mets anymore; in fact, we plan to copy and paste the previous sentence for the next big injury and just change the particulars. But Beltran's operation differs from all of the other Mets' procedures from the last twelve months in one key manner: The Mets didn't want him to have it. It turns out that Beltran went rogue on this one, and when his osteoarthritis became painful as he began his offseason conditioning program, he had the procedure done by his personal physician in Colorado without the club's blessing. That twelve-week figure, by the way, isn't when Beltran will return to the lineup: He can't resume baseball activities until then, meaning he'll essentially be starting his spring training when the rest of the Mets open the season against Florida. The Times says it's unlikely he'll return to the lineup before May. If there's any silver lining at all here, it's this: If you, like us, first heard something was up via Will Carroll's tweet — "Big news pending for mets. Doesn't sound good." — you could have dreamed up something even worse. (Our worst-case guess last night: Tommy John surgery for Johan.) So at least it wasn't, you know, that.